Unfortunately, the boating season is winding down in many parts of the country and it is time to start thinking about protecting your valuable recreational asset. Winterizing a boat reminds me of the old commercial that says “pay me now or pay me later.” The time and effort you spend now will have a definite effect on your boat’s performance, or lack of it, and certainly save you time, effort and money come spring. You should remember that your insurance policy may not cover damage done by lack of maintenance or neglect. The best place for your boat to be during the winter is out of the water, under cover, in a climate-controlled boat storage area. This, however, can be expensive. If you don’t have this option perhaps you should consider shrink-wrapping your boat. This, too, is a little expensive but provides a very protective cover. Short of these two items, make sure that your boat is well covered with a tarp or some other sturdy cover. Your first step in winterizing should be to make a checklist of all items that need to be accomplished. Check the owner’s manual of your boat and motor(s) for manufacturer’s recommendations on winterization. If you are a new boat owner, perhaps you should employ the assistance of a friend with experience in winterizing or hire a professional to do the job. The following is a generic outline of areas which should be of concern to you, however, there are many resources on the Internet with more detailed and specific information. 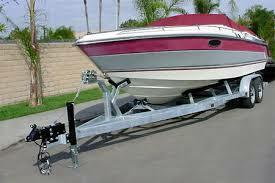 Inboard Engine(s) – You should run the engine(s) to warm it up and change the oil while it is warm. This tends to allow impurities to be drained away with the oil. You should also change the oil filter(s). Flush the engine(s) with fresh water. You should circulate antifreeze through the manifold by using a pickup hose from the waterpump to a bucket of antifreeze. Start the engine and allow the antifreeze to circulate until water starts to exit the exhaust. This process will vary slightly depending on whether you have a “Raw Water” cooling system or an “Enclosed Fresh Water” cooling system. While you’re in the engine room you should also change the fluid in your transmission. Remove spark plugs and use “fogging oil” to spray into each cylinder. Wipe down the engine with a shop towel sprayed with a little fogging oil or WD-40. Stern Drive(s) – You should thoroughly inspect the stern drive and remove any plant life or barnacles from the lower unit. Drain the gear case and check for excessive moisture in the oil. This could indicate leaking seals and should be repaired. Clean the lower unit with soap and water. If your stern drive has a rubber boot, check it for cracks or pinholes. Grease all fittings and check fluid levels in hydraulic steering or lift pumps. Check with your owner’s manual for additional recommendations by the manufacturer. Outboard Engine(s) – Flush engine with fresh water using flush muffs or similar device attached to the raw water pickup. Let all water drain from the engine. Wash engine down with soap and water and rinse thoroughly. Fuel – Fill your fuel tank(s) to avoid a build up of condensation over the winter months. Add a fuel stabilizer (such as one found here) by following the instructions on the product. Change the fuel filter(s) and water separator(s). Thanks to Jerry Turley, a member of the USCG Auxiliary, for pointing out that there are two theories on whether you should disconnect the fuel hose and run the engine until it stops or treat the fuel. Nissan recommends draining fuel for lay-up. Their purpose is to make sure that all fuel is drained from the carburetor to prevent build-up of deposits from evaporated fuel. Other manufacturers such as Mercury, OMC, Force and all recommend treating the fuel with a fuel conditioner and stabilizer, have a full tank, and running treated fuel into the engine prior to the balance of the winterizing process. The presence of treated fuel prevents the interaction with air. Also, the small amount of fuel left after draining does not have a chance to evaporate and form the “varnish” type residue. Fuel conditioners are available at marine dealers, marine stores and auto parts stores. You should consult your owner’s manual for the manufacturers recommendations on how to handle fuel in your winterization process. Use fogging oil in the cylinders to lubricate the cylinder walls and pistons. Apply water resistant grease to propeller shaft and threads. Change the gear oil in the lower unit. Lightly lubricate the exterior of the engine or polish with a good wax. At about 10:00 am yesterday we received the following announcement from the public affairs office of Coast Guard Sector Hampton Roads in Portsmouth, Virginia. In order to safeguard vessels, ports and waterfront facilities from damage due to Hurricane Sandy, the captain of the port is establishing a temporary safety zone that will close the coastal waters of the eastern shores of Virginia and Maryland from Cape Charles Light, Va. to the border of Maryland and Delaware and out 12 nautical miles. The safety zone is in effect from 8 a.m. Sunday until weather subsides and verification of all navigational aids is complete. Port Condition X-RAY remains in effect for all other waters within the Hampton Roads Zone including the ports of Hampton Roads and the Virginia waters of the Chesapeake Bay. Facility operators and agents should contact Coast Guard Sector Hampton Roads at 757-638-6641 to request permission for vessels to enter the port. It is primarily the facility operator’s decision to allow vessels to remain moored during the passing of the hurricane. Facilities that do not allow vessels to remain moored must provide them with sufficient notice to allow the vessels time to move to a safe mooring, hurricane anchorage or to depart to sea. Facilities and vessels should communicate with each other regarding their plans. Facility operators should continue making preparations to ensure all loose cargo, cargo equipment and debris are safely secured. All vessel moorings should be reinforced. Anchored vessels should prepare for severe winds. Additional anchors should be made ready to let go, and preparations should be made to have a continuous anchor watch. Also, boaters shall monitor VHF-FM channel 16. The Coast Guard urges the public to listen to weather information available from other sources and not call the Coast Guard for weather-related information. For additional information on the storm, visit the National Hurricane Center site at http://www.nhc.noaa.gov/. Boaters can monitor its progress on NOAA weather radio. Information can also be obtained on small craft advisories and warnings on VHF-FM channel 22A. 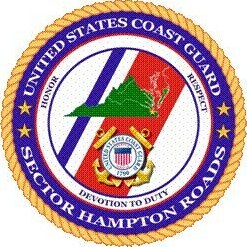 Mariners can view the latest port updates for Hampton Roads on the Coast Guard’s Homeport site. Call 757-668-5555, option three, to reach the port condition hotline for a recorded message of current hurricane conditions. The Port of Hampton Roads Maritime Heavy Weather Contingency Plan explains all port conditions and is available at http://homeport.uscg.mil/mycg/portal/ep/portDirectory.do?tabId=1&cotpId=26. Visit the Federal Emergency Management Agency’s website at http://www.ready.gov/ to stay informed and for tips on how to prepare and plan for severe weather. Injuries on the water come in many forms and degrees of severity – from an embedded fishhook to broken bones. Since medical attention is seldom close by, make sure you have a marine First Aid Kit that is well-stocked, up-to-date, and at the ready. Putting together your own marine First Aid Kit is easy enough to do. Start by stocking up on many of the same items you’d keep in your medicine cabinet at home, then take into account the added hazards of sun, wind, water, and water-related activity. Consider any special needs, such as prescription medications that you or your passengers may require, and be sure to take extra to avoid getting caught short if your return is delayed. Once your kit is assembled, remember to check it each year at the start of boating season and replace any over-the-counter first-aid medications that are past their expiration date. Emergency phone numbers: doctor, pharmacy, poison control, etc. Prepackaged First-Aid Kits sold in drug stores, marine supply stores such as West Marine, or through online retailers are also a good choice and often come with convenient features, such as color-coding to match the nature of the injury. Just be sure to choose one that is appropriate to the distance you plan to travel away from populated areas, and how quickly medical help is likely to arrive in the event of an emergency. For personal watercraft, for example, a small kit for treating minor cuts and scrapes is probably adequate. For boating farther from shore, a more elaborate kit may be needed to render immediate first aid until medical help arrives. You’ll probably want to throw in an Emergency Position Indicating Radio Beacon (EPIRB) as well, so that help can locate your boat as quickly as possible. Having a proper First-Aid Kit on board can help you render immediate emergency care, and sometimes even save a life. It’s one of the safety-related items that Coast Guard Auxiliary and United States Power Squadrons® vessel examiners discuss when conducting an annual Vessel Safety Check (VSC) on recreational boats. You might also consider enrolling in a first-aid training course provided by the American Red Cross or community health associations in your area. Quick action may be required for such life threatening emergencies as heart attack, stroke, or seizures, as well as for more serious sprains, burns, puncture wounds, cuts and internal injuries. It pays to know how to proceed. Regardless of the supplies you have or your level of first-aid training, if you find yourself in a true medical emergency, seek help immediately. Make sure you know how to summon emergency medical assistance by marine band radio, not just a cell phone. Prepare an emergency contact list before leaving home.